There was pandemonium last night during the ward congress of All Progressives Congress, APC, in Anambra State, with the party’s candidate in last year’s governorship election, Dr Tony Nwoye accusing the Minister of Labour and Productivity, Senator Chris Ngige of a plot to hijack the party in the state. 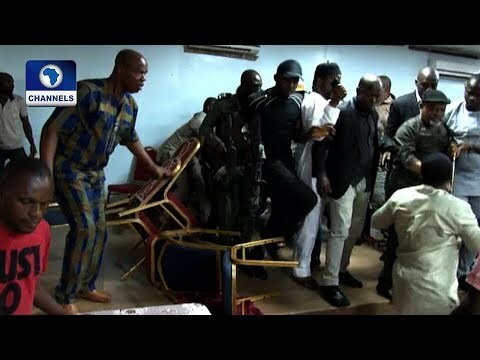 The minister escaped mob attack at the APC meeting in a hotel in Awka, Anambra State. Security personnel repeatedly fired repelling shorts into the air to scare the mob who charged at him. After being accused of trying to hijack the party, Ngige, on his part, however, said there was no problem, insisting that every effort was to ensure that APC was properly organized in the state. At the meeting, Nwoye alleged discrepancies in the lists and accused Ngige of usurping the functions of the congress committee. According to him, it was improper for Ngige to say that ward congress held on Saturday when none took place. Nwoye, who is a member of the House of Representatives, said he was refraining from speaking because he might be accused of being bitter over the conduct of many APC chieftains during the governorship election, which he ran and lost on the platform of the party. Tempers rose during the harmonization of lists from the wards following allegations that few party chieftains merely compiled names from all the 326 wards in the state. Amidst the confusion and charged atmosphere, security operatives were shooting in the air to scare those trying to attacks dignitaries.